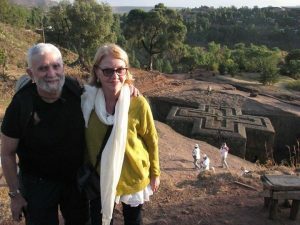 We had an early flight to Lalibela. JD asked us to reduce our luggage a bit, since we were only going to be there for two nights. I had brought a compactable bag that we were able to load with extraneous stuff that we wouldn’t need. We checked it at the Radisson where we were returning before our flight back to the States. Serious photographers, like most of our fellow travelers, carry a lot of heavy luggage packed with equipment. Secure luggage storage is a very handy service provided by the hotel. Lalibela is a small town of roughly 15,000 people during non-festival times. I read somewhere that out of that population about a 1,000 are Orthodox Christian priests. 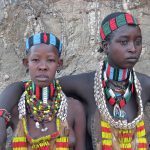 The town is situated 8,000 feet above sea level, in the mountains of north central Ethiopia. 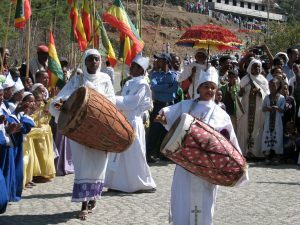 We were going during the Feast of the Epiphany or Timkat in Amharic, so the population probably doubled because Lalibela is a major pilgrimage site. It is the second most holy city in the country next to Aksum where orthodox traditionalists believe the actual Ark of the Covenant given by God to Moses is located. In Western Christianity Epiphany commemorates the Adoration of the Magi or the Three Kings. One of those kings is thought to have been an Ethiopian bearing frankincense. In Ethiopian Orthodox Christianity and other Eastern Orthodox sects Epiphany marks the time Jesus was baptized in the Jordan River. Both events basically represent Christ revealing himself as the Son of God to the whole world, not just to the Jews. 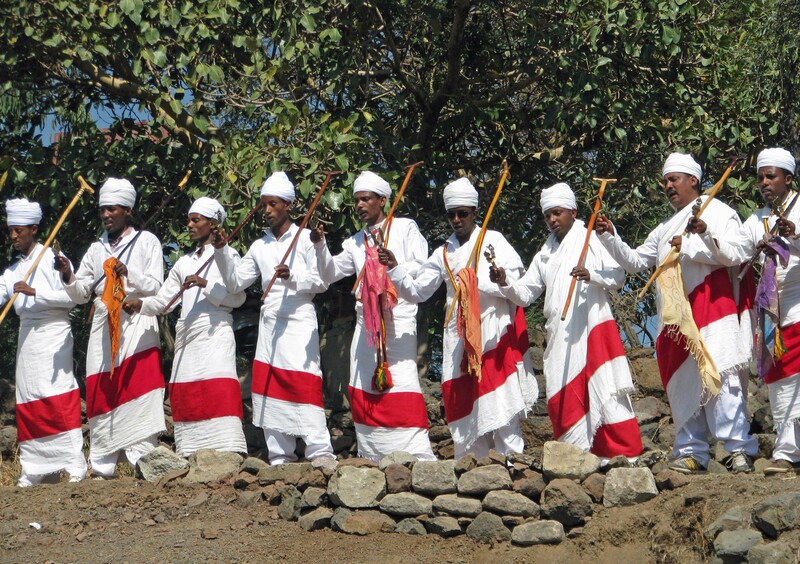 Lalibela’s attraction as a pilgrimage site is its eleven monolithic rock-hewn churches. The churches were built at the behest of King Lalibela of the Zagwe Dynasty that ruled the country during the 12th and 13th centuries. 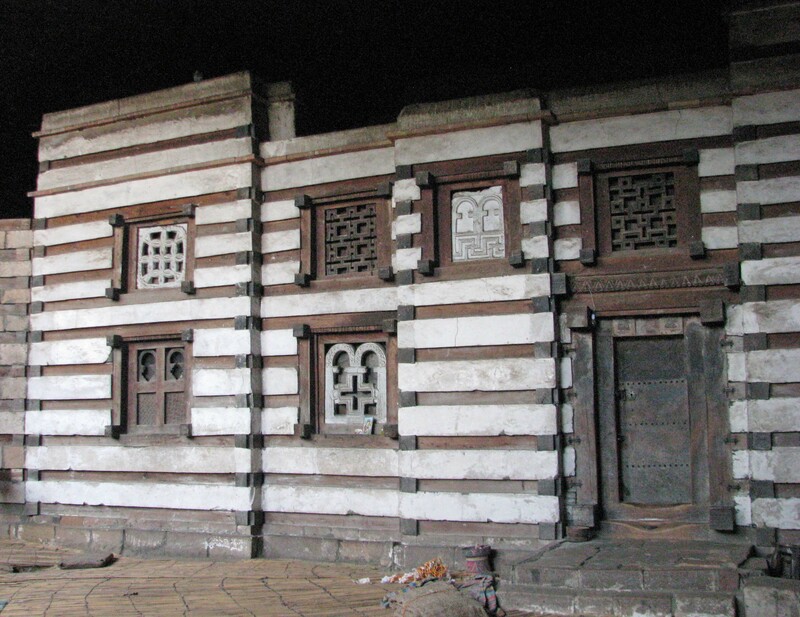 At that time the city of Lalibela was called Roha and was the dynasty’s capital. The king is said to have traveled in his youth to Jerusalem. When Jerusalem was captured by Muslims in 1187 AD, the king vowed to build a new Jerusalem where Christian pilgrims could visit. 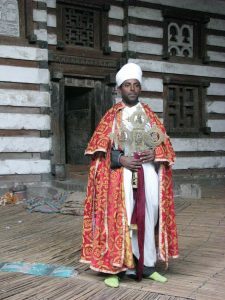 Apparently, he was currying favor with the powerful Orthodox Church to help counter rivals to his throne and the influence of the city of Aksum home of the reputed Ark. Lalibela is said to have labored twenty years overseeing the building of the churches and then abdicated his throne to become a hermit. He is honored as one of the church’s most beloved saints and the city was renamed for him. Needless-to-say, there are lots of stories about their creation. One tale professes that much of the work was done by angels at night while the workmen were sleeping. When the first Europeans saw the churches in the 16th century, stories spread that the churches were built by the Knights Templar. But it’s quite clear that Ethiopians built them and they didn’t need any outside help. Fact and fiction merge in Lalibela making it a fascinating place. 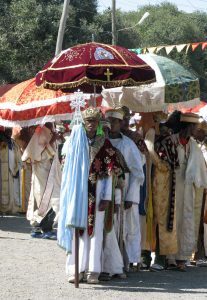 The Ethiopian time machine had thrust us from animist cultures in the Omo Valley and set us down in the time of the earliest Christians, so early that the rituals we observed are practically ancient Jewish traditions, particularly those surrounding the parading of the Tabot (the model of the Holy Ark) to the nearby River Jordan. This is not the same Jordan River as in the Middle East but was named for it as part of making Lalibela the New Jerusalem. 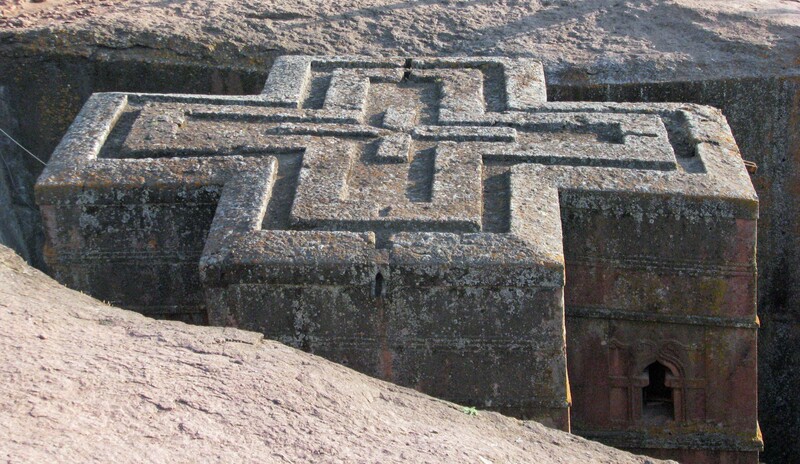 Christianity came to Ethiopia very early, probably in the 1st century AD from Egypt. 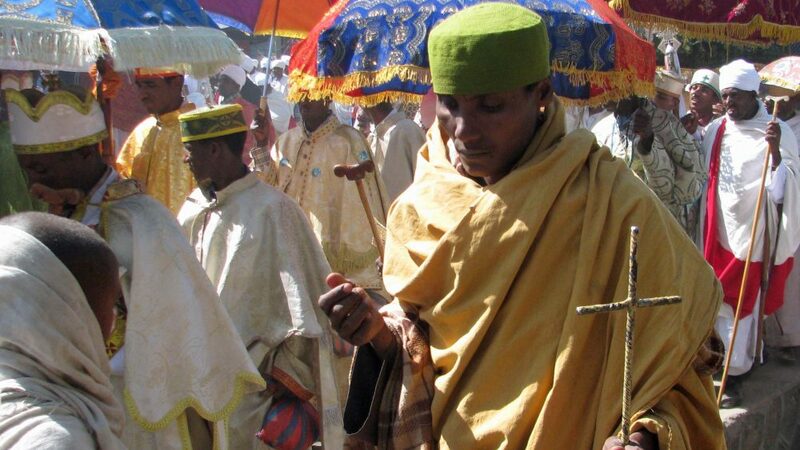 The monotheistic religion found fertile ground to grow because Ethiopia already had a significant Jewish population with roots going back to Solomon and the Queen of Sheba. You can imagine all the stories about that alliance. Upon arriving from the airport, we immediately dove into the Timkat celebrations. There were lots of people but the crowds were very mellow. There were several processions from the churches occurring at once, mostly male, but there was one procession of women drumming, singing and dancing. We were told they were from a daycare center. 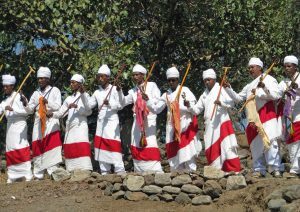 At one point roughly fifty priests or more dressed in white robes gathered on the hillside overlooking the processions and engaged in a call and response with the crowd and their counterparts below, swaying and bowing to the drumming. We were caught up in it as well. It was very cool. We took a lunch break at a fine place that served us freshly slaughtered chicken. We had noticed the live chickens being carried away as we were getting off the bus from the airport. 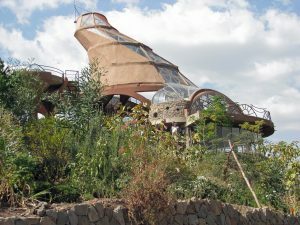 JD informed us that he had been able to upgrade our hotel from one in town to the Mountainview Lodge high up in the hills overlooking Lalibela. We spent the afternoon visiting three of the churches. UNESCO has declared the churches and the traditional houses surrounding them World Heritage Sites. The first church was Biete Medhane Alem (House of the Savior of the World) and is believed to be the largest monolithic church in the world. The rock-hewn churches are actually carved, not constructed, from the top down, so they are even with the surface of the surrounding ground. 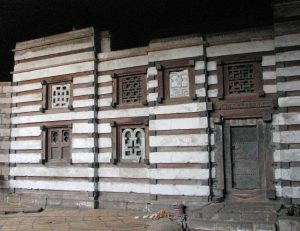 Some restoration work has been done to the outside of Biete Medhane Alem, mainly on the exterior pillars of one outside wall, but considering the buildings date from the 12th century, they are in remarkably good condition and all are still in use. I have seen the rock-hewn churches and houses in Cappadocia and they are literally crumbling over time because the rock is soft lava rock. 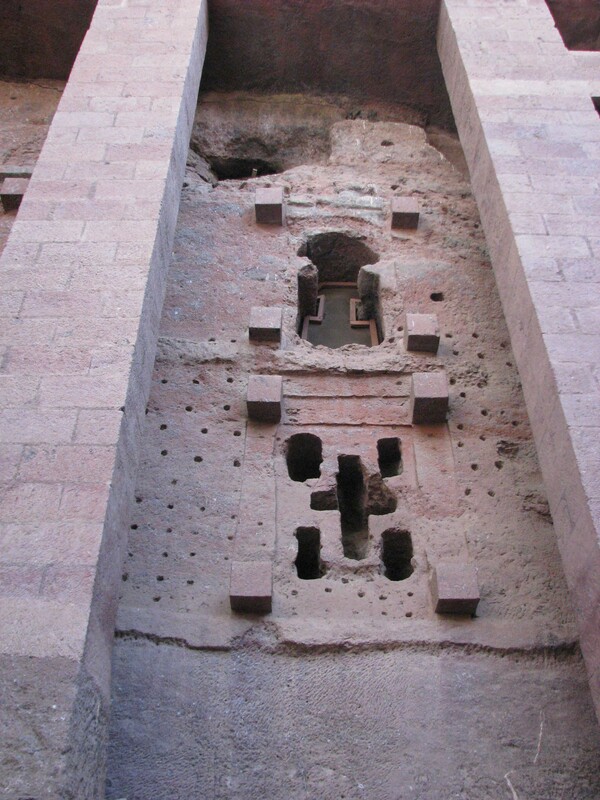 The Lalibela churches are carved out of single blocks of granite. My bucket list includes Petra in Jordan, another rock-hewn community. Getting into and out of the churches is somewhat of a challenge because you have to take your shoes off before going inside and the floors are uneven and the steps a bit high. At the suggestion of one of our fellow travelers, I would recommend bringing a walking stick. I noticed that the male congregants generally carry tall canes with them. This enables them to lean during the long services held by the Ethiopian Orthodox Church. There are no pews. The second church we visited was Biete Maryam (House of Mary). It is supposed to be the oldest of the churches and has replicas of the tombs of Adam and Christ inside. Right outside is a cistern containing rather slimy green water that women who are barren are supposed to bathe in to become fertile. The third one was Biete Giorgis (Church of Saint George). 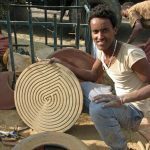 Biete Giorgis is just amazing to see on the outside. 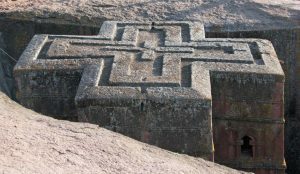 It’s carved into the shape of a cross with three crosses inside of each other. Form and function merge because one of the crosses is actually a drainage ditch. Since all the churches are carved down into the granite hillside, water drainage is a major issue. It was late in the afternoon when we checked into the Mountainview Lodge, a veritable aerie with raptors flying all around. The hotel is architecturally interesting if a bit run down and the view is outstanding. A group of us gathered on the outside terrace for drinks and we were treated to a sunset that was an archipelago of lights and clouds. One of our fellow travelers was a retired airline pilot and he swore there was a “green flash.” Green flashes are optical illusions that happen right after sunset or before sunrise when a green flash appears just above the upper edge of the sun. It lasts only a second or so and sometimes looks like a green ray projecting out of the sun. The flash is most often observed by pilots. Dinner that night was the usual buffet but the food was fabulous, especially the “fried” lamb ribs. The chef was actually standing outside the dining room as we left to receive comments about the food. The only downside was the initial lack of serving utensils and no labels explaining what the food was. The staff quickly remedied that. After breakfast early the next morning we were driven back to town for a brief stop to watch the Timkat mass held outdoors. To me as a recovered Roman Catholic still in love with the Latin mass, the ritual was familiar but foreign at the same time. 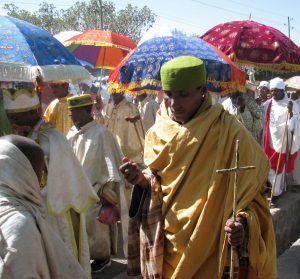 Sacred rituals in Ethiopian Orthodoxy are performed in Ge’ez, the ancient but no longer spoken language of the Aksum kingdom. The sermons are given in the local language. Next on our agenda was a bumpy hour and a half ride through the very interesting countryside to the church of a cave monastery built in the 11th century by Yemrehanna Kristos (Christ Show Me the Way) and named for him. There is major construction being done on the road and electrification seems to be coming to the villages. If you block out the new road construction from your view, the surrounding area looks like I imagine it has appeared for 2,000 years, basically shepherds and subsistence farmers eking out a living in a high desert. At an altitude of roughly 9,000 feet it was a bit of a hike up to the church but quite doable. I thought the interior of this church was the most interesting one we saw. At one point the head priest brought out an ancient brass cross and he was wearing the same bright green sock slippers Ethiopian Airlines gives business class passengers. No restoration work has been done on the church, and because it’s in a cave and not exposed to the elements, the outside walls and ancient murals are in really good shape. Way at the back of the church are the mummified remains of more than 7,000 pilgrims who had traveled there from as far away as Egypt and Syria to die. A medical doctor traveling with us observed that some of the skulls looked like they had suffered severe trauma. Maybe all isn’t what it seems. 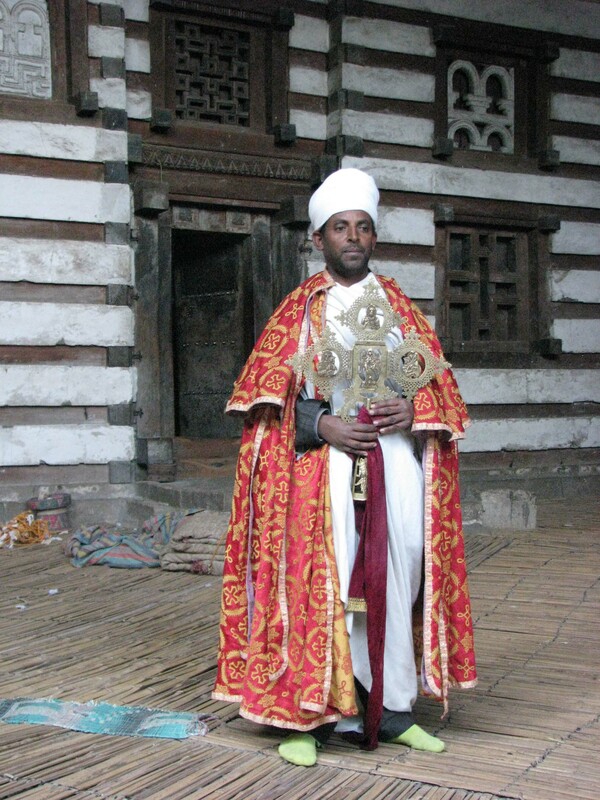 Yemrehanna Kristos was Lalibela’s predecessor and set the style for the latter’s churches. Back down at the beginning of the trail up to the monastery the local people operate small shops selling souvenirs, many handcrafted items that they use in their daily lives but exotic to us and religious items bought by pilgrims. I purchased a nice goat skin “lunch box.” I noticed a small group of young men getting mildly high chewing khat, the leaves of a flowering plant that contains an amphetamine. Khat is one of Ethiopia’s largest exports. We had lunch reservations at a truly bizarre restaurant near our hotel called Ben Abeba, a name that combines Scottish and Amharic to mean “hill of flowers.” It is owned by a retired woman teacher from Scotland and a local Ethiopian man who hired two young Ethiopian architects to design the building. They came up with a design that is supposed to reflect the surrounding hills but looks like something out of a Star Wars movie. The dining areas are “flowery concrete goblets [that] hold tables aloft, offering up diners to the sky,” as a Scottish newspaper described it. Most folks describe its shape as “snail-like.” At any rate, the food is not bizarre but quite good, a blend of traditional Ethiopian fare and Scottish favorites like shepherd’s pie. Shepherd’s pie appeared on another buffet we encountered in the Omo Valley. After lunch some of our group opted to tour the inside of the Church of Saint George, but Noel and I decided to take the afternoon off. We took the time to visit a couple of small souvenir stands near our hotel and bought a really nice polished steel processional cross and a beautifully illustrated new prayer book as gifts. The family that was running the shop was enjoying that wonderful, freshly roasted Ethiopian coffee in the late afternoon. They invited us to join them, but we gratefully declined and headed for the hotel bar to enjoy some good Ethiopian wine. We flew back to Addis Ababa the next morning to prepare for our evening flight home on fabulous Ethiopian Airlines. We had changed a significant amount of US dollars into birr at a currency exchange at the Radisson at the start of our journey and didn’t spend very much of it, so the first thing we did was change it back. Major word of warning, when changing money abroad, always keep your receipts and understand any restrictions in changing it back. At the Radisson currency exchange you have a limit on how much can be changed back into dollars and you can only make the exchange once. Fortunately, we were within our limit and had the receipts, but a few hours later when I found a few more birr, we weren’t allowed to change that back. But that was okay because we spent it at the airport. We ran into a similar situation in Argentina a few years back. We had a final dinner and farewell with our fellow travelers before heading to the airport. During dinner Chris Rainier did a terrific presentation on Ansel Adams and talked about his, Chris’, evolution as a professional photographer and how he discarded the notion of objectivity in journalism when he was on assignment in Somalia. 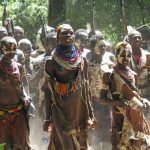 He reiterated his commitment to using his skills to empower indigenous people and document their cultures. I strongly suggested he get to know the work of the late Milton Rogovin. I need to mention the really hard work and meticulous attention we enjoyed from JD Kling who handled the thankless, but most vital task of the logistical arrangements. And lastly but definitely not least, we want to acknowledge Henok Kebebe, our local Ethiopian guide, who enthusiastically led us to enjoy and begin to understand the incredible time machine that is Ethiopia.